The CT has a super-slim profile that makes packing discreet and easy. The grip angle and 5.52-inch overall length are just right, with no annoying pinky-dangle for average size hands. Fairly aggressive texturing on the polymer grip makes a confident grip easy in less-than-ideal conditions, but its profile isn’t so rough as to snag hand-knit sweaters, which I wore over it on a couple occasions. This pistol has been around since 2014. It has a black polymer frame and stainless steel slide and slide stop lever in matte finish. The slide adds a subdued, nickel-toned shine and sporty touch without being at all gaudy, remaining no less concealable than a blued finish. This reviewer harbors no fondness for “look at me” finishes on a gun whose job is to be concealed until needed. With the CT, Kahr struck a nice balance in the appearance and concealability department. 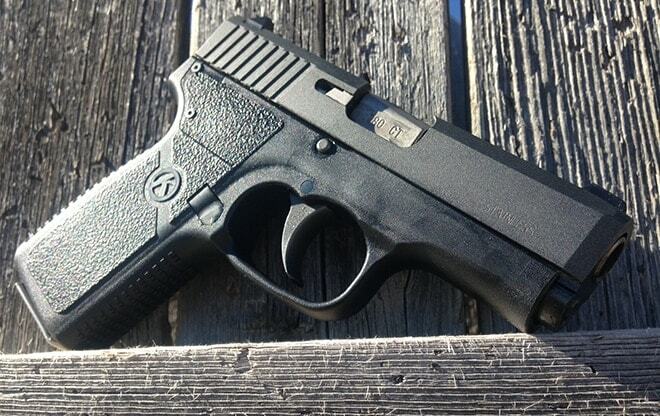 Kahr stuck a small, shiny, rectangular plate with the serial number low on the left side of the grip. Since that side rides against my body in concealment, it’s not a bother. Was I left-handed, I’d cover the plate with dark paint to prevent any shine-through under a thin shirt. My range tests are usually done in the manner that I’m guessing many new owners follow—pick up gun at store, go to range, open box, load, shoot. Note the absence of “lubricate” and “read instructions.” Oh, and I usually have at least two brands of ammunition to try in any given firearm. Since .380 is a common caliber in our team’s personal and teaching collection, we tested a range of ammunition brands, with disparate results. The shiny metal, flush-fitting magazines (two came with the gun) hold seven rounds each. Already I was a bit jealous as I looked down at my Glock 42 and its famously disappointing six-round mag next this slimmer one that holds more. Hmmm. I loaded up Winchester ammo from the white box. Seven rounds cycled nicely. Even in windy conditions, my shots made a tidy group, centered on target at seven yards. Next, I loaded Perfecta 95 grain. To my surprise, the first round didn’t feed into the chamber… tap, rack… it happened again. I forced a round in, which fired, only to cause a double feed. Puzzling, considering how the Winchester had run without a hitch. Then, I stuffed the mag with BVAC (is this stuff even made anymore?) swiped from the depths of my ammo stash. Same result as Perfecta. A change to Prvi Partizan’s PPU brought back the smooth cycling. Between that and Winchester, I continued to shoot for a total of about 70 rounds without issue. Finally, five rounds each of pricey Hornady Critical Defense and Remington hollow point rounded out our test with success. Based on this 150-round test, the conclusion is: the CT380 is very ammo-sensitive, but dependable with ammo it “likes.” Thankfully, high-quality defensive rounds suited to this gun’s intended purpose worked flawlessly. The magazines fall freely from the gun upon release, whether full or empty—an often-overlooked but important feature in a small concealment gun that may need to be reloaded in a hurry. The magazines fit flush with the grip—nice for concealability; a bit hard to grasp when clearing a double feed malfunction. It’s a small detail, but I really like the fact that the seven-round mags are stamped “Kahr 380/7.” Makes me wish other brands would label things in a useful manner. The trigger has an initial pull that’s on the long side but its smoothness and clean break make up for that. Reset is clearly felt and eliminates about a third of the slack present in the first press. The rear sight is nicely angled downward from the center and facilitates the greatest possible view of the target. There’s a white spot at the center of the rear sight blade, which aligns with the white front sight to serve, I suppose, rapid alignment. It’s alright. Kahr offers night sights for other models, and would do well to expand that option to the CT. Though the CT is really compact, it’s easier to handle than most itty-bitty guns and easy to shoot accurately. The long trigger pull is a tad annoying, but tolerable. Overall, the CT 380 is well-suited for a concealment and/or beginner’s gun because it rewards good form and has no weird reset traits like some other small 380s which shall remain nameless here. The CT is enjoyable to shoot, and yours truly almost never says “enjoyable” in relation to little guns. I view them as a necessity for off-range life. It was actually hard to call it a day when the ammo supply ran low. The CT 380 is enjoyable on the range because it functions like a larger gun. No stupid magazine tricks, the slide lock and mag release are where one expects them to be, and there’s no counterintuitive mechanical “safety” measures to hold a person up in a moment when the gun just needs to work… this is, after all, a firearm intended for self-defense. Post-range, it was time to clean the now slightly used gun. The field strip procedure is somewhere between a 1911 and the super-simple process common to the striker-fired market. It entails lining up hash marks on the slide and frame, then removing a 1911-style takedown pin, AKA slide lock lever—this step requires a flat lever like a slotted screwdriver. With the pin removed, the slide is easily skimmed off the frame, revealing a silvery three-inch stainless steel barrel with a highly polished bore, rather vertical ramp, and rifling grooves carved in sets of two, rather like the yellow lines on a highway. There are two recoil springs around a plunger—perhaps there’s only one spring on the 9mm version of this pistol, and the extra on this one is to make up the room for otherwise shared parts—that’s just a theory. Takedown and reassembly became easy by the third round. It seemed the pin and surrounding structures needed a bit of break-in, or perhaps I just got better at the procedure. Unfortunately, Kahr took the generic path on the owner’s manual. The CT model isn’t even mentioned, though many others are, and it wasn’t clear from the manual if I was doing things right. Compensating for this is the company’s own takedown and reassembly video online… though the CT isn’t mentioned there either, nor are the dual springs, but a little observation makes their proper positions obvious. The video tutorial makes a point about ensuring the proper direction of the open and closed ends of the recoil spring, however the test copy’s two springs have closed ends all around. The company issues a couple admonitions in the manual; one being about the gun requiring a 200-round break-in period. Perhaps I just received an outstanding sample from the stable, but this one ran fine with the right ammunition, from the first shot. Maybe, after it has more rounds through it, it’ll develop a wider brand appetite. I’m just glad it runs the Winchester and PPU FMJ, which are affordable, brass-cased practice rounds. The other “warning” advises the user to release the slide with the thumb-to-slide stop lever method rather than my customary way, which is an overhand grip pulling the slide back so the recoil spring is at full compression, and let fly. This method is a fraction of a second slower, however I use it because it’s dependable across brands and platforms. It works for every pistol regardless of size in relation to my not-huge hands, and because some handguns tend to not seat the round in battery using the thumb-release method. I tossed this bit of advice as the opinion of whoever wrote the owner’s manual, as it ran fine with the method I use, which is advocated and used by many reputable schools and instructors. The CT380 impressed this Glock carrier so much that I stuck the gun into the Sticky brand, size MD1 holster that I wear for the G42, which conveniently fit. The CT380’s been my EDC companion for about six weeks, except at night when I opt for the G42 with its night sights and auxiliary light. With some carry time under my belt (literally), I’ve come to really like the easily concealed, flat profile and knowing I’ve got an additional round on board as compared to the bulkier Glock 42. The extra mag in my left front pocket leaves no, or very little, visible lump as the G42 mag does, due to its thinness. It’s definitely the most comfortable of the several models I’ve carried on my person. A problem cropped up recently, and for this writer, it’s a deal-breaker in terms of this being a primary carry gun. At around six weeks of daily carry, the spare magazine, stowed in a pocket, began losing rounds—up to four at a time. I was running the first time this happened, and the magazine was in my pocket with (yes I know it should be alone, but…) a car key. There was no apparent interference of these items, though, just a bunch of loose stuff jingling in my pocket. I moved the key to a belt loop, reloaded the mag, and just a mile later it happened again. This problem now happens even after an hour of mostly standing and not being terribly active while the magazine’s in the small, narrow pocket on the front of tactical pants, with nothing else in the pocket. It’s damaged my trust in the potentially essential extra ammunition source. An internet search revealed I’m not the only one who’s had problems with rounds falling out of the extra magazine. Kahr 380 and 9mm magazines have apparently had this issue for many years. It’s a shame they don’t fix the problem, as I otherwise would be recommending this gun for concealed carry. Real-world prices hover around $300, plus or minus $35. There’ll always be voices in the gallery clamoring that .380 is too small to be effective. I’m not going to argue. I do challenge those folks to do some online or range research on the performance of modern defensive ammunition in this caliber. With the Kahr CT380, I know rounds will hit where I aim, and with the right brand of ammo, it will go “bang” when I tell it to. If a backup magazine isn’t of concern, it represents a worthy choice.